January and Feb issues with my hard work inside!! Noooo but they sound amazing. I love me some Samoas! Samoas are my favorite Girl Scout cookie. This is the first time I've seen these chocolates though, and they are really good. 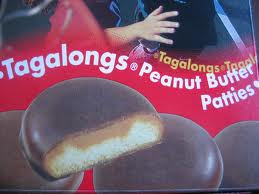 My second favorite is the tagalongs....just in the fridge though, not frozen. You just don't get enough cookies in the box though. Thanks!! I made it alive. I didn't even land in the plane bathroom this time. Are those the peanut butter ones ? I remember years ago, the boxes used to be huge. Now they're so tiny! oh **** damnit, I'm dying over here! I don't really care for the thin mints. Too chocolaty, I think they would be better if the inside were a graham type cookie. I usually buy 10 or 15 boxes of Samoas and put them in the freezer then get one out when I want some. So nobody else has seen these little chocolates? Must be something new. I've found just the opposite to be true.